Currently + TBB Asks, February 2018. I cannot believe we are already one week through February and that this first week of February, here in Michigan we have had snow falling every single day. I cannot wait till Spring, this year more than ever before! To make matters worse, I think I am getting the flu for the third time this Winter season. Seriously guys, why is everyone getting sick so often this year?! Anyhow this is the month of Valentine's Lovers and Women's Heart Disease - so wear those red dresses, ladies. subscribing: at Ipsy lately. I received my first Ipsy subscription in November and have been getting them for 3 months now. I have tried a few products and liked them. I like that they are travel size because it gives you the option to buy a bigger size if you love them, but also you get to try them first without being stuck with a full size. I also like that each package comes with an adorable makeup bag - I can always use new, fun makeup bags. But I have heard great things about Birchbox too and that they include full sizes sometimes so I will try out Ipsy a little longer, we shall see. For 10 bucks a month there isn't a lot to loose. wishlisting: nothing in particular and that is a good thing. My closets and drawers are exploding with clothes. I need to purge instead of buy! watching: "9-1-1". It is the only new show or TV show I am currently watching besides "The Bachelor" which I always watch. I really like Arie but I am not so much into this season, it is kind of a big bore. "9-1-1" on the other hand is a great new TV show on Fox. Far-fetched and overwhelming?! Exciting and bold?! Yes and yes. But it keeps you on your toes, it has good actors and good acting and I like the storylines. It is quite different than most police and fireman dramas out there. Go give it a shot! 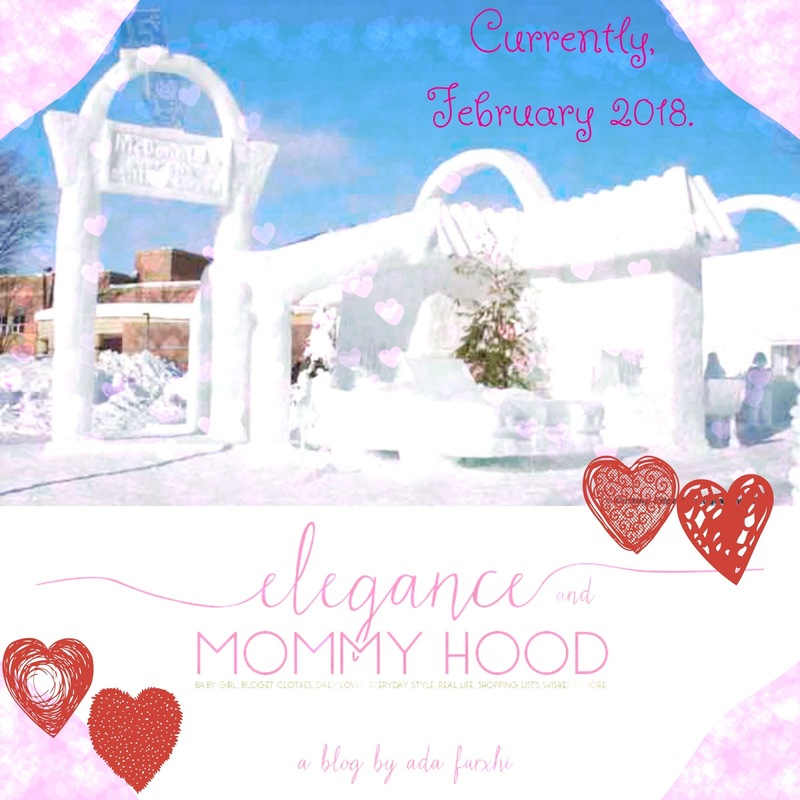 Since it is a new month, I am also joining the ladies of The Blended Blog for their monthly questionnaire. 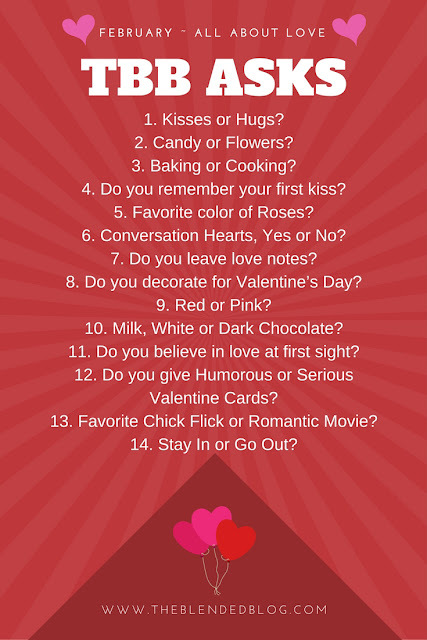 This month it is Valentine-themed, of course. 1. Both Kisses and Hugs. On a romantic level, a good, long+soft kiss is the way to go. But (in general) nothing beats a good, strong, heart-felt, chest to chest hug. 2. Flowers. I love good fresh flowers. I am picky with candy and I don't eat a lot of chocolate so I rather buy my own candy. 3. Cooking. Cook me a great dinner and I am all yours lol (so to speak). I like desserts but not always. I have a salty tooth rather than a sweet one. 4. Yes, of course. My first childhood kiss and my first real kiss. I remember them both. 5. White, Lavender and Yellow. But I love red roses too, who doesn't. 6. No. I don't see a need for them. 7. Yes. I have before. 8. Very little but yes I decorate. I have a few touches of Valentines through the home this year. 10. Milk and Dark Chocolate. But I do love a mixed white+milk chocolate, too. 12. I like the sweet, sugary, super romantic cards. But the last few years I love the humorous ones, too. 13. There are three: The Notebook, Pretty Woman and Ghost. I love all these 3 movies so much. 14. Go Out. I think Valentine's day is when you should get all dolled up and let someone else do the cooking and cleaning up for you.